Secretary of Homeland Security John Kelly. IDENTIFYING THE WORST member of Donald Trump’s Cabinet is no easy task. From Attorney General Jeff Sessions recently mocking the state of Hawaii to Secretary of State Rex Tillerson being completely over his head to Education Secretary Betsy DeVos and HUD Secretary Ben Carson being, well, Betsy DeVos and Ben Carson, the competition is fierce. This week, however, a new strong contender emerged: Homeland Security Secretary John Kelly. 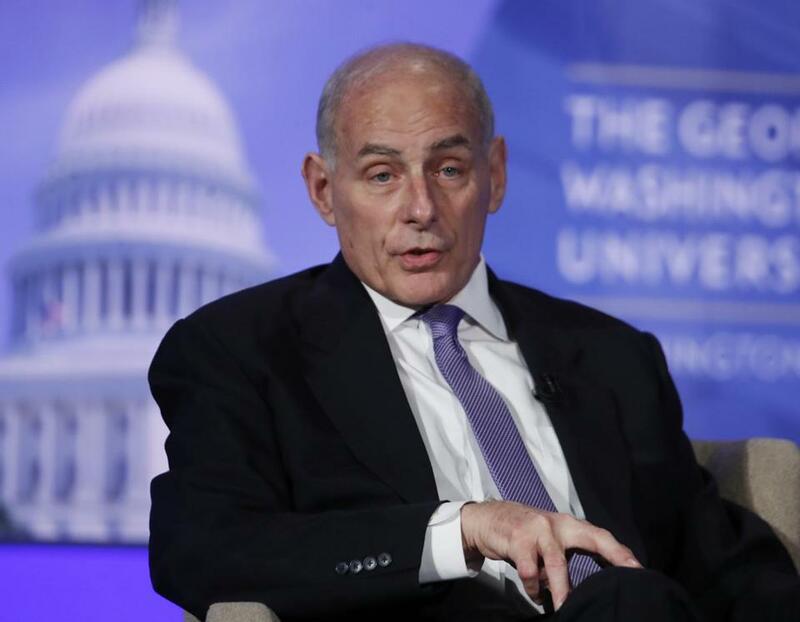 When Kelly, a former decorated Marine general, was nominated to be head of Homeland Security many hailed the pick and said Kelly would bring competence and sanity to an administration lacking in both qualities. Last week he delivered one of the more unhinged speeches that you will ever hear from a Cabinet secretary. It was a terrifying reminder of the depths this administration will sink to in order to sell its toxic policies. He also claimed that morale issues at the department are a result of a “default to believing the self-serving accusations of a wrong doer” rather than department officials. Because really nothing inspires greater confidence in law enforcement than the notion they should be a) above criticism and b) assumed to always be acting in good faith. But then Kelly jumped out of the crazy tree and hit every branch on the way down. In discussing his agency’s mission, Kelly said this (slightly annotated). Crime rates have been declining for decades. Since 9/11, approximately 94 people have been killed on US soil by jihadist terrorists — a bit more than the number of Americans killed every single day in gun violence. Cyber-terrorists have never killed an American citizen, no failed state threatens America and more Americans are killed by lightning strikes than sadistic radicals. On Sunday Kelly continued the onslaught. There’s pretty much no evidence that terrorists are using the southern border as a transit point for entering America. He also said the thing that “keeps me literally awake at night is the threat against aviation,” even though there is literally no safer form of travel and no element of American life more solidly protected from the threat of terrorism than flying on a plane. But Kelly is in a bind here. When you work for a xenophobic president intent on building a wall that America doesn’t need and deporting non-violent immigrants to win over white nationalist supporters, then hyping security threats, particularly from terrorism, is the only way to rationalize these policies. It’s like justifying a $600 billion military budget by portraying the world as being more “dangerous” than ever; or selling a foreign war by overstating the danger to America from weapons of mass destruction. This kind of threat inflation is basically the default foreign policy mantra in Washington. Dangers are always growing; America is always under attack; the world is always dangerous; conflict is always looming . . . except for the myriad ways none of this nonsense is true. In fact, the world has never experienced a combined period of greater freedom, safety, health, and raised living standards than right now; and America, which faces no serious military rival, is probably the safest great power in history. Kelly is simply following a path well tread by other snake oil salesmen who’ve misused the authority that comes with public office to scare Americans into supporting bad policies. Kelly may not be the worst of Trump’s Cabinet picks, but he is definitely the scariest — and his willingness to make comments so utterly divorced from reality and so clearly untrue should embarrass us all.